Houses & Homes VA: How to choose the correct internet speed without overpaying! How to choose the correct internet speed without overpaying! Determining just how fast of an internet connection you need really isn’t very difficult. It all depends on what you use the internet for and how many people will be using it at the same time. If surfing the net and checking emails is your main goal than you don’t need lightening quick speed. However, if you have a house full of game playing teenagers and movie lovers than your requirements are going to be much different. Keep in mind that multiple users are sharing your internet connection and that will definitely slow things down. One thing you need to know is that the advertised download speed that your local ISP’s (Internet Service Providers) brag about is only half the story. Yes, maybe you do have a lightning fast 50Mbps connection but how does that help you if the server you are connected to will only send you information at 5Mbps? It’s not only about how quickly you can receive information; it’s also about how quickly the other computer is sending that information to you. Watching movies (streaming video) online definitely requires a faster connection than checking emails or chatting on Facebook but there is such a thing as too much. As an example, Netflix only requires a 5Mbps connection to watch movies without interruption at up to 1080p resolution. YouTube, HBO Go and other similar services are about the same. You only require a higher connection speed if you want to watch video at a higher resolution than 1080p and many times this is not worth the extra cost. 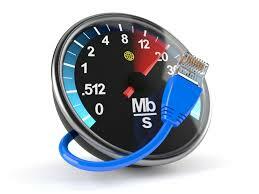 You may have noticed that your upload speed is much less than your download speed as well. This makes little difference to some people because your upload speed only determines how quickly you can send something on the internet, not how quickly you can receive information. If you often find yourself uploading videos to YouTube, talking on Skype or sending large files to your Dropbox account than your upload speed will matter. Keep this in mind when you are deciding just how much you’re going to pay for internet service. You will need a more expensive plan if you need higher upload capacity. Here is a general guideline to help you decide just how fast of an internet connection you really need. There’s no sense in overpaying for speeds that you will never use but on the same hand not enough speed will make using the internet a real hassle.